What makes different tube amp heads different? We can divide any complete all-tube guitar amp system into three major sections, each of which has important effects on the final sound: The preamp, the power amp, and the speaker cabinet. All three of those are essentially fixed for a given channel in all but a very few amps. You can swap out tubes for compatible tubes, with largely subtle differences in final sound. So you might have channels with different circuit designs in the same amp, but generally if you want a different preamp sound, you have to buy a different amp. In amps with adjustable bias voltages, the power tubes can be swapped for a few other compatible tubes and of course the bias can be adjusted. There are a few amps where the amp class is selectable. Output transformers are essentially fixed and are popular targets for high end mods. Drivers can be and often are switched out. Cabinets are not really changeable but different cabinets can be used in different situations, and it's often possible to run more than one cabinet at a time to blend different sounds. Of course there are many categories of both solid state and circuits that can affect tone and response, not to mention the many variations in speakers and cabinets. But the main difference between tubes and the majority of solid state amplification is the non linear transfer curve of a tube, vs. the nearly straight line linearity of most solid state devices, such as transistors and FETs. 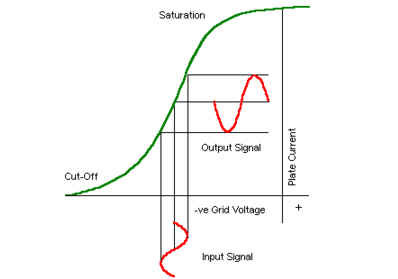 Consider this example of one tube circuit's transfer curve. Without getting too deep into complex theory, notice that the signal in this case has been "biased" (or positioned) at nearly the straightest point along this curve. But imagine a situation where the signal is intentionally made so large, that it will be affected by the lower and upper parts of the transfer curve, where there is indeed much more curve! The effect would be to compress the lower and higher parts of the input waveform. Taking this further, in real tube circuits the curves near the top (saturation) and bottom (cutoff) are seldom this identical. So a typical methodology is to use two tubes in a combination called "push-pull", where the top half of the signal is amplified by one tube, and the lower part is reversed and amplified by another. After this, the second half output is reversed again, and the two halves are combined in a transformer. This would then result in identical shaping / compressing of both halves of the waveform. Though this kind of instantaneous compression is really a form of distortion, it is in fact a very musically useful kind of distortion! It is very rich in odd harmonics, which indirectly cause each note played to sound somewhat like it has a built in major chord! The sound is also often associated with "warmth". Another useful effect is that at low volume levels, the dynamics of the guitar are NOT compressed, offering the sonic appearance of wider dynamic range and sensitivity, and that glassy clarity we all like to hear, while louder playing is slightly subdued volume wise, along with a very musically pleasing "crunch" that is subtly added as the signal level increases. It is not impossible to simulate this effect in a solid state circuit, but it almost always requires complex modern DSP techniques, in which the sound is rapidly sampled and processed in real time by a fast CPU. It is more difficult however to simulate this effect with ANALOG solid state circuits. And certainly, while the NATURAL "distortion" created by tubes and their characteristic transfer curves has always been the foundational hallmark of classic rock guitar sound, the natural distortion of solid state amplifiers is almost always less useful, and often ugly. It is everything about the amp. This is why artists have various amp and cab combinations in order to get all the tones they want. While you can use the same tubes as your favourite amp, you'd also need to have the same bias conditions, the same circuitry etc so do your research carefully. Not the answer you're looking for? Browse other questions tagged guitar amplifiers electronics amplification or ask your own question. 2 Heads on one Cab? How to buy the “right” power attenuator for a tube amplifier? Is it feasible to modify a combo-amp so the line-out doesn't silence the speaker? How can I send an output to a PA from my combo practice amp?